Find answers below to some of the most common questions we receive related to navigating our website, posting jobs, and more. If you're looking for help with best practices, nonprofit resources, governance or policy, visit our Knowledge Center. Members and nonmembers must log in using the same account in which they posted the job. Once logged in, click on the posting(s) you'd like to edit. This will take you to your original posting in which you will see an edit button. Please note that your edits will take up to 24 hours to process. How do I remove my job posting? Members and nonmembers must log in using the same account in which they posted the job. Once logged in, click on the posting(s) you'd like to edit. This will take you to your original posting in which you will see an edit button. To remove this listing, change the remove date to yesterday's date or the date it should have been taken down. Member: be sure to log in every time you visit our site. Under the Careers tab, select the Job Board. You will see a link to Post a job. You will be sent an email when your job has been posted and one week before it is set to be removed. Nonmember: nonmembers will have to purchase a job posting. Under the Careers tab, select Job Board. You will see a link to become a member or purchase a job listing. If you choose to purchase a job posting, you will be prompted to create an account and submit payment. You will be sent an email when your job has been posted and one week before it is set to be removed. Can I get a receipt/invoice for my job posting? Yes, members and nonmembers will be emailed a receipt after purchasing a job. If for some reason you do not receive a receipt, please Contact Us. Jobs can be searched by Category, Region, and Organization Type. 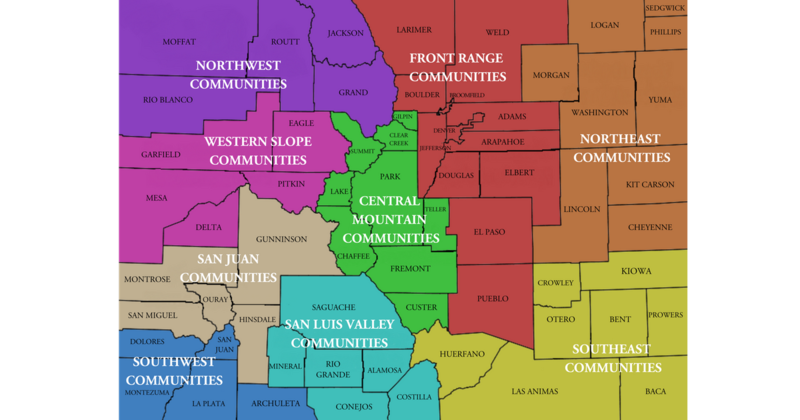 Use this map to help determine your Colorado Community Regions(s). Where can I post volunteer positions? Colorado Nonprofit Association only posts Jobs, Internships, and Resumes. Check out Spark the Change Colorado (formerly Metro Volunteers) or other local and national volunteering sites. If you are interested in posting a volunteer event, please see the Community Calendar section. Do I need to log in to access my member benefits? Yes, member benefits can only accessed after logging in to our site. From there you can access the Knowledge Center, Community Conversations, Help Desk, Member Directory, and your member discounts. It is a good ideas to log in each time your visit our website. How does my organization add or remove employees? To add the employee: Select member login, then Member Get Access. Find your organization and enter your personal information. After creating a personal account, you will be taken to your account page and have access to member benefits. To remove the employee: To remove employees, you must have administrative permissions for your organization. You may log in to your personal account to disable users from the Employees with Member Access list. If you do not have administrator permissions, please Contact Us. I forgot my log in information. Forgotten Password: Thank you for your patience while we work to fix a temporary technical issue with our password reset link. Please Contact Us. Login and mouse over Membership in the list on your profile. Select renew your membership. Can I get a receipt for my renewal? Receipts are automatically generated when paying by credit card. If you renew via check, an email receipt will be sent to you when it is received. Personal information such as name, job title, phone number, and interests can be edited on your profile landing page after logging in. Select Edit My Personal Information. To change your affiliation with a member organization, please Contact Us. What is the Business Member Directory? The Business Member Directory is your source for finding nonprofit services from businesses across Colorado. Our business members are listed by Colorado Region, Area(s) of expertise, and Percentage of client base that is nonprofit. Whether you're looking for an expert grant writer, PR agency, recruitment firm or even a web designer, you'll find a great selection from our Nonprofit Consultant Directory. All Colorado Nonprofit Association business members may be listed in the Consultant directory. For more information on our business membership offerings, visit our Membership Page. Directory listings can be searched by Colorado Region, Area(s) of expertise, and Percentage of client base that is nonprofit. Use this map to help determine your Colorado Community Regions(s). Where can I find more information about events? Under the Events page, visit Upcoming Events to view all upcoming Association events. The Colorado Nonprofit Conference, C3 Forum, and Colorado Nonprofit Week have their own pages that can be found under Events. The closer to the date of a major event, the more information we can provide. If an event is posted on the Community Calendar, please use the contact information provided for more information. You will receive a confirmation email after registering for all events. If for some reason you do not, please Contact Us. Where can I find my registration discount codes? You must be logged in to access the member rate for any Association hosted event. If the event is hosted by a third party, please Contact Us for the discount code. How do I register for an event as a member? You must be logged in to access the member rate for any Association hosted event. If you cannot register at the member rate, your membership may have lapsed or your account is not tied to a member organization. How do I submit an event to the Community Calendar? Visit our Community Calendar from the Events tab. Click on submit an event today in the first paragraph. You will be taken to the events form. Members will not be charged; nonmembers will be charged. What types of events can I submit? How long will my event stay on the Calendar? Your event will stay on our calendar until the date of the event. How do I subscribe to an e-newsletter? Each option corresponds to a section in Principles and Practices for Nonprofit Excellence in Colorado (P&P). Any e-newsletters, updates, or email tagged with these labels will be sent to you. How do I opt-out from an e-newsletter? If you no longer wish to receive emails from Colorado Nonprofit Association, select Opt-out from the bottom of any of our emails. You can also log in to your account and amend your interests. I want to sponsor an event and/or page. Who do I contact for more information? Contact Lindsay Newman, Director of Development, for sponsorship opportunities and information.